Chicken Biryani is one of my most favorite dishes and definitely one of the most requested meals at my house. We often pair it with a cooling raita and squeeze of fresh lime for a hearty meal. There are many variations of this recipe that originate in several states of India. My favorite, of course, is the one made by my mom that I grew up eating. Warm, deep spiced Chicken Biryani, with freshly ground spices, caramelized onions, marinated tender chicken cooked over long grain basmati rice! For many years now we have enjoyed my mom’s “Dum Biryani”. Cooked in homemade ghee, homemade garam masala, fresh herbs and basmati rice, this Biryani is everyone’s favorite. I have simplified the recipe so that it can be easily prepared for a weeknight meal using the Instant Pot. Pat dry the chicken before marinating to avoid access liquids. Marinate the chicken for at least 20 minutes. Use plain full fat yogurt for the marinade. Use fresh garam masala. Homemade garam masala works the best! Deglaze the pot using some of the marinated chicken to remove any browned bits from sautéing of the onions. This will help the Instant Pot come to pressure and also prevent “BURN” signal. Deglaze the pot, once again just before adding the rice. Make sure all of the rice is under the liquids before closing the Instant Pot. It is normal for the top layer of the rice to look a bit undercooked. 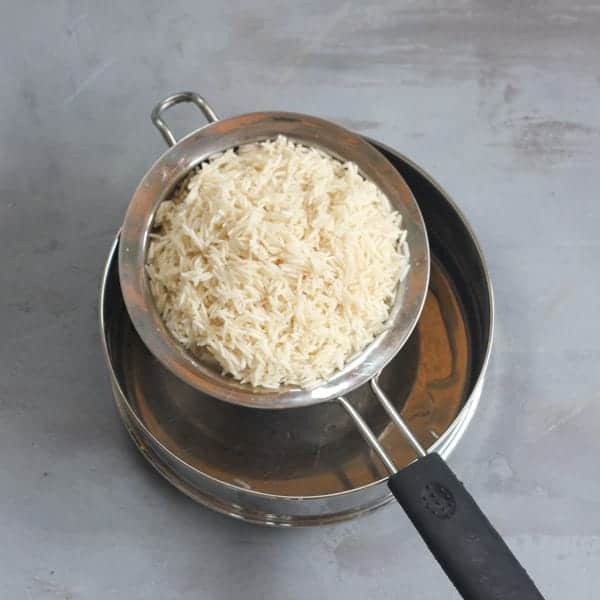 Simply fluff the top layer and then gently mix the biryani with a silicone spatula. This recipe makes medium spicy Biryani. For extra spicy add jalapeno. OR add another teaspoon of garam masala to the chicken. 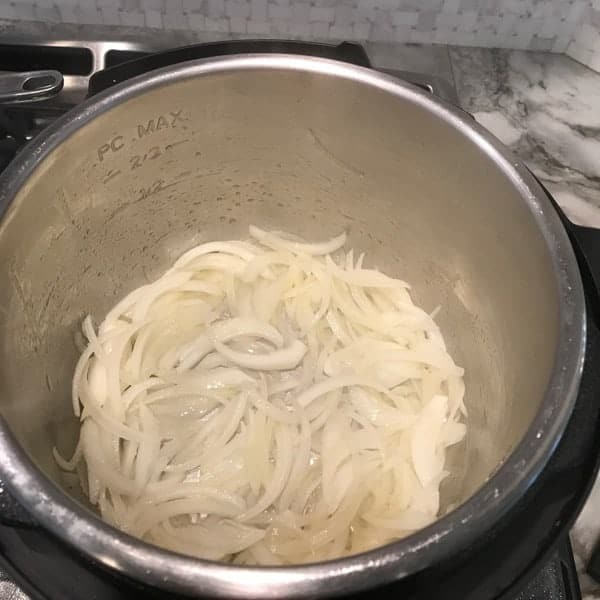 Lastly, although, Sauté (more) function on the Instant Pot works great for true one pot cooking, you can also caramelize the onions using stove top in a non-stick pan. This will speed up the process and also will prevent the stainless steel insert getting scorched which may lead to “BURN” notice on the newer Instant Pot’s. Marinate the chicken for at least 30 minutes. You can also marinate ahead of time, for up to 12 hours in the refrigerator. Soak the rice for 20 minutes, which makes rice fluffy and light with long separate grains. I would recommend extra long grain basmati rice for making chicken biryani. Some of my favorite brands are Kohinoor and Royal, both available in Indian groceries. As the rice soaks, you can start to caramelize the onions. 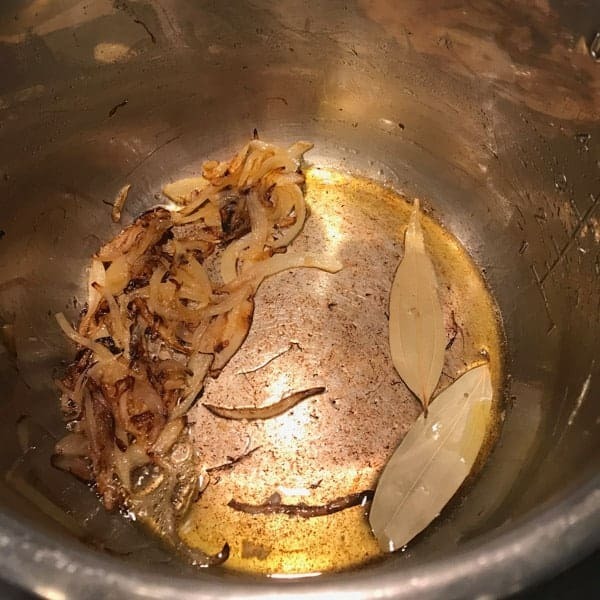 Caramelizing in the Instant Pot may cause the bottom of the pot to get scorched. Remember to deglaze the pot well with the liquids from the marinated chicken. Pressing cancel during deglazing also prevents further overheating. Bone-in chicken legs or drumsticks need longer time to pressure cook than the basmati rice. To achieve this, we first pressure cook the chicken for 4 minutes. For boneless thighs, just sautéing for 2 to 3 minutes cooks the chicken partially and then they can further cook along with the layered rice. Drain the rice, completely after soaking for 20 minutes. Then layer the rice on the partially cooked chicken. Add water (which should be 1:1 ratio with rice) and make sure all the rice is under the liquids. After pressure cooking the rice, if the top layer looks a but undercooked, simply fluff the top layer with a fork. Use a silicone spatula to gently mix the rice and the chicken pieces at the bottom of the pot. Garnish with the caramelized onions, saffron mixed with milk, cilantro and mint. Layer over with hard boiled eggs. 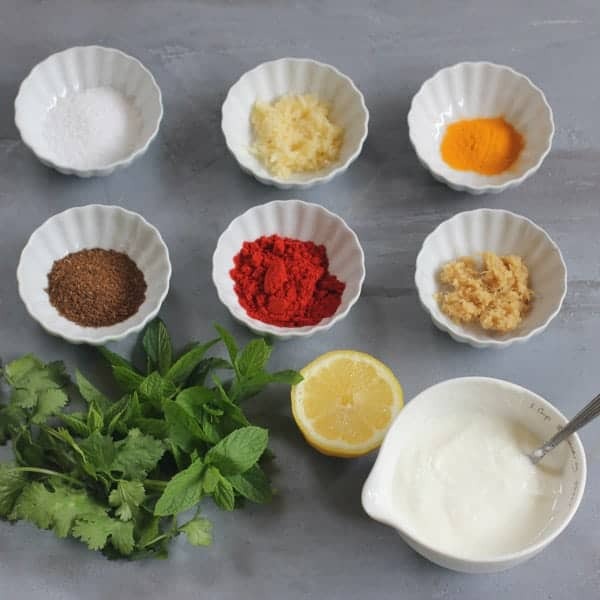 Make Marinade by mixing garam masala, ginger, garlic, red chili powder, turmeric, mint leaves, half of the chopped cilantro, lemon juice, yogurt and salt. Add chicken and coat evenly with the marinade. Keep in the refrigerator for at least 30 minutes. While the chicken is marinating, wash and soak the basmati rice in water. Keep aside for 20 mins. Turn the Instant Pot to Saute(Hi). After the ‘hot’ sign displays, add 2 tbsp of ghee and add thinly sliced onions. Cook stirring frequently for 10 mins or until the onions are golden brown and caramelized. Take out half of the onion and keep aside for garnishing the biryani. Add 1 tbsp of ghee to the Instant Pot with half of the caramelized onions already in the pot. For extra spicy Biryani add sliced jalapeno. Add bay leaves and half of the marinated chicken and the liquid from the marinade. Press Cancel. Mix well, deglazing the pot with a spatula to take out all the browning of the pot from sautéing the onions. This is an important step that will prevent the possible "BURN" signal during pressure cooking. Once all the browning on the pot is completely removed, stir in the remaining chicken. a) For Chicken on bone - Close the Instant Pot and turn pressure valve to sealing. Select Manual/Pressure Cook and adjust the time to 4 minutes. Follow with Quick release. Mix the chicken well, once again scraping the bottom of the pot removing any food stuck to the bottom. b) For boneless Chicken thighs - Cook on Saute mode for 2 to 3 minutes. Scrape the bottom of the pot to make sure there is no food sticking to the bottom. Drain the rice and gently pour over the chicken. Add 2 tsp of salt. Add 3 cups of water. Close the Instant Pot and turn pressure valve to sealing. Select Manual/Pressure Cook mode and adjust the time to 6 minutes. Follow with Quick release. Open the Instant Pot. If the top layer of the rice looks uncooked, simply fluff the top layer of the rice. Then mix the rice with the chicken on the bottom of the pan. Using a silicon spatula to gently mix will also prevent the rice grains from breaking. Garnish with the remaining caramelized onions, saffron mixed with milk and cilantro. Serve with Raita , hard boiled egg and lemon wedges. To make the raita, whisk the yogurt in a medium bowl. Add onions, tomatoes, salt and mix well. Garnish with cilantro. Deglaze the pot using some of the marinated chicken to remove any browned bits from sautéing of the onions.. This will help the Instant Pot come to pressure and also prevent "BURN" signal. ** This recipe makes medium spicy Biryani. For extra spicy add jalapeno. OR add another teaspoon of garam masala to the chicken. 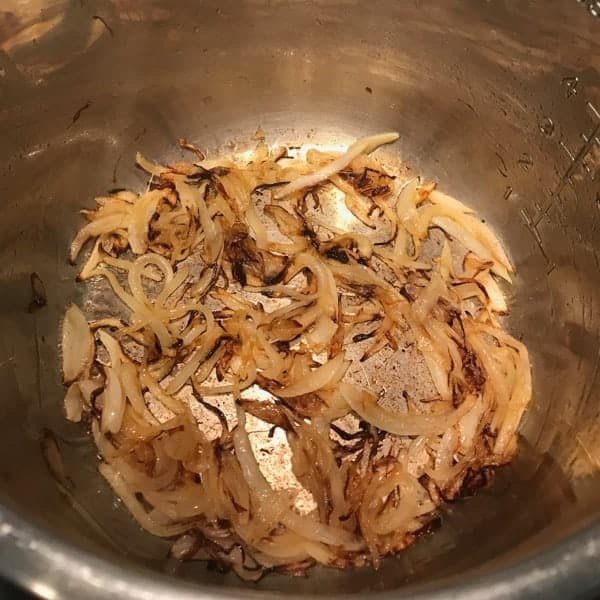 Tip - Although, Sauté (more) function on the Instant Pot works great for true one pot cooking, you can also caramelize the onions, stove top in a non-stick pan. This will speed up the process and also will prevent the stainless steel insert getting scorched which may lead to "BURN" notice on the newer Instant Pot's. Absolutely wonderful 🙂 Thank you for the recipe. Looks like the perfect biryani! Thank you Annika! It sure is. This looks amazing, any chance you are willing to share the spices used to make your masala for this? I find too much difference and fillers in many of the pre made “garam masala” available where I live. Hi Zoe, Ofcourse, I can share the recipe for my garam masala. 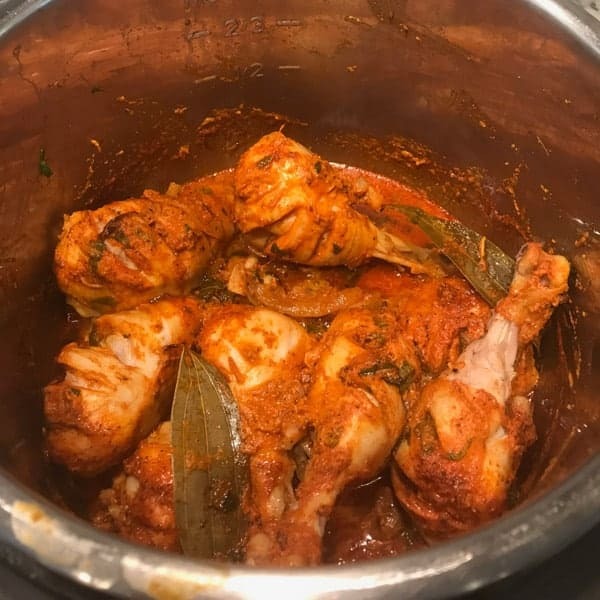 I have the link to it in the blog post for Biryani but here it is again – http://ministryofcurry.com/homemade-garam-masala-2/ This is my go to garam masala for my recipes and once you make it you will find many other recipes on my blog to use it! Let me know how you make out. Best recipe I’ve ever had. Thanks so much for sharing. looks AMAZING! can you please suggest some vegetarian variation instead of the chicken? Hi Krishna, Sure I will post a vegetarian Biryani recipe soon. Love Biriyani!! Your recipe sounds very delicious. Beautiful share Archana. Hi Christina, Yes you can soak the brown basmati and then use your method of high 15. I have not tried making this with brown rice but I know brown rice takes much longer than basmati. Soaking will reduce some of the time. I tried this again tonight with the brown rice using the 15 minute suggested by Christina. It was very watery when I opened it. Put it back on for another 15 and then did QR better than the first time I opened it, but think I’ll have to try it a few times with the brown rice and work on the timing. Hi Krina! I have to agree that I still haven’t had a chance to try this with brown rice. Make sure your chicken is dry when you marinate it. I will post an update as soon as I get a chance to try the brown rice biryani. What’s the max time you’d marinate the chicken? I want to marinate overnight. Great share Archana! I love biryani and am drooling here looking at your prefect biryani photos! So Archana if one is using skinless and boneless chicken breast or thighs then does one skip step 5 and proceed to step 6? Kalyani, Yes you can proceed to next step which is – b) For Chicken Breasts – Mix well and cook on Saute mode 3 mins. I have such warm memories of my mom making this and how amazing the house would smell. This looks so delicious! Thank you Jess! It is a comfort food for me too! Rama, I use Kohinoor extra long basmati. But any long basmati rice will work. Thank you so much just made it, eaisiest Biryani recipe ever made with no compromise on taste!! Shiji, So glad you enjoyed the Biryani recipe. I have a bunch of other IP recipes on my blog if you are interested. Thank you of your feedback. 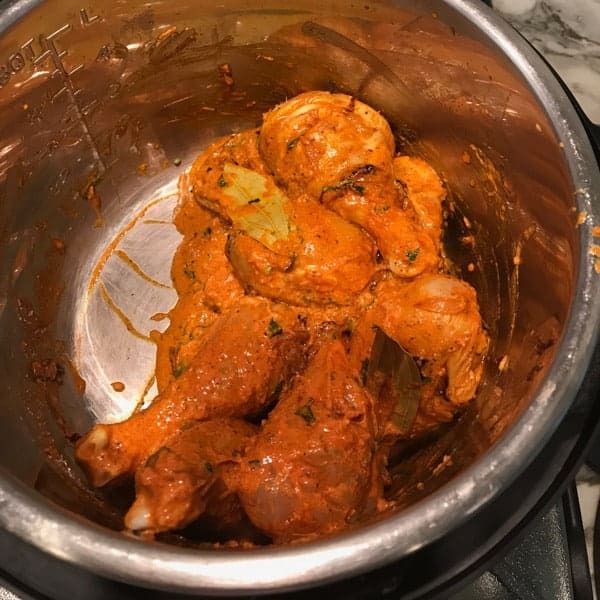 New instant pot user here – I made this recipe this evening and it turned out watery. Does it make a difference if the Basmati rice was long grain? I got Basmati rice, however I don’t think it was long grain which may have caused it to be watery and mushy. It had great flavor though! Hi Nancy, Basmati Rice will not make the difference. Do you wash your chicken or use frozen? IF so, Make sure you dry the chicken with paper towels before marinating. That could add to extra liquids. Also make sure to use full fat yogurt only as yogurt has a lot of water too. If you see the video when I pour the marinade it wasn’t too watery. Before adding rice, if you see a lot of water being released, reduce the water you add over rice. Instead of 2 cups add only 2 or 2-1/2 cups. I hope you will give it a try again! Thank you for your feedback. I’m in the UK, I made this last night and it was amazing. It is very similar to an authentic recipe I use from Bangalore, but with fewer steps. I used a chilli powder that I have which comprises of ground chillis. But have just read somewhere that red chili powder is ground cayenne. Can I ask what you use? Hi Penny! So glad you enjoyed the Biryani! I like to take lot of unnecessary steps as well as ingredients out of my recipes just to make it easy for everyone. Chili powder is just ground chilies. It could be any kind of friend red chili,my favorite is the kashmiri chili powder which is vibrant red but mild. I do not really use cayenne in indian cooking as it is way to spicy and takes away the flavor of the main dish. 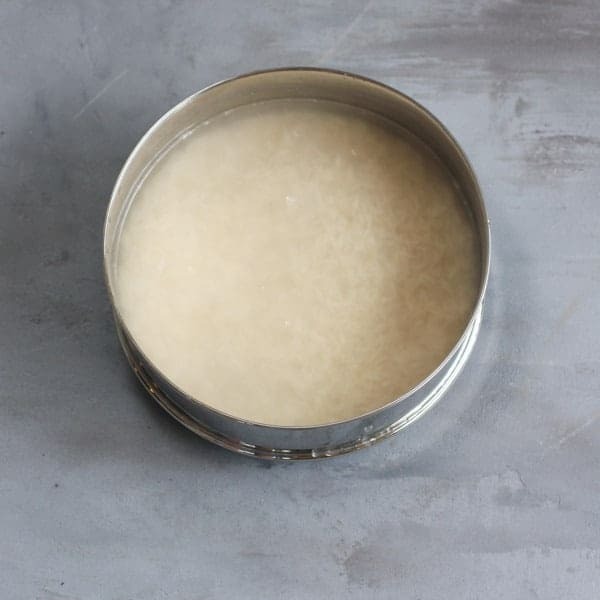 How do you make your ginger paste and garlic paste? I use a mini grater and grate fresh ginger and garlic. If I need larger quantity I use my food processor. Thanks, looks very tempting. Just one question, by QR do you mean 10 min QR or as soon as cooking time is up. 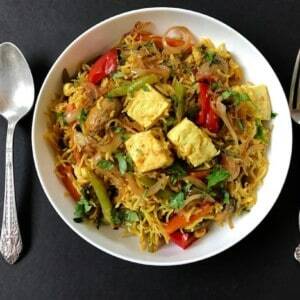 Hi Archana – I am a new IP user and tried your biryani receipe last night. It was delicious!! I am going to make it again this week-end and wanted to know what cooking modifications need to be made if I want to double the chicken? Thanks! Hi Annette, Most of the cooking times remain the same. It will take longer to caramelize the onions, but thats basically it. Let me know how it comes out? Thank you so much. If I use huge chicken legs, would I have to cook longer ? Nur, not sure how big they are but I would say add another minute in the beginning when you cook just the chicken or allow 5 mins of NPR before opening IP to add rice. Hi Archana, I tried your recipe today and it came out great and my kids enjoyed it too! The only difference was that after I added the rice layer I had to do manual mode for six minutes twice because after the first six minutes the rice hardly cooked and most of the water remained. I made sure I had it on seal and closed it properly. Has that ever happened to you? Also what would happen if I put it on rice mode instead for 20 min? Finally, have you tried this with lamb or goat meat and, if so, did you modify the cooking time? Hi Faridha, So happy to know that your kids enjoyed the biryani. When you did QR first time was there any pressure built? After I start the IP, if the stainless steel pin does not pop up in a few mins I gently push the lid down and the pin pops up if there is enough pressure. I have also opened the IP and secured the ring back in once for another recipe where the pressure was not getting built. I don’t think the pressure built up properly the first time so I will try out your tips. By the way have you tried this with red meat – curious how you would modify the recipe/cooking time? Thanks! Faridha, a few people have tried with lamb with the same cooking time and recipe and it has worked well for them. Let me know if you make it too! tried your recipe today! Family loved it! I did have excess water leftover from cooking chicken so i had decreased amount of water i put in with rice. It was a simple delicious recipe. I will be try the saag daal next. Thank for posting! Mehvash, Thank you for your feedback. 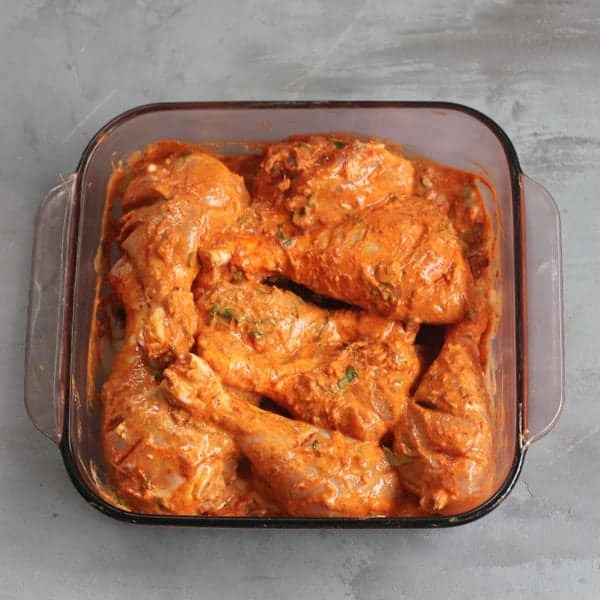 When you marinate the chicken make sure it is dry and also use whole milk yogurt which should reduce extra liquids. But it was a good call that you removed the extra liquids. Do let me know how you like the Saag Daal. Hi if I’m making it with boned meat do I add water when I put it on manual for 4 minutes? Hi Zara, water contents from the marinade are enough to cook chicken on the bones. You do not need to add extra water. Hi Radha! you are right. I buy the whole chicken legs or drumsticks and then de-skin them at home. I hope you enjoy the Biryani. Let me know! This looks great! If I want to cut the recipe by half (for 3 people) can I just do half of all the recommended quantities and add 1.5 cups of water instead of 3 cups at the end? Thanks! Hi Anu! Yes you can do half of all the quantities just keep the same pressure cooking time. Time caramelize the onions will be less too. Awesome! Can’t wait to hear. ? That is awesome Anu! So glad you enjoyed this. There are a bunch of other recipes on my blog that use my garam masala. Hope you will try some. Thank you! Hi, can I make this with boneless chicken thighs? What would be the setting and timing for cooking the chicken? How about boneless lamb? Thanks. Hi Protima! Just reduce the timing by a min for boneless chicken. Although, I have not cooked Biryani with lamb, several other readers have tried with same timings and has worked well for them. Please let me know how you like this! Thanks. So to confirm when using chicken thighs, I should reduce manual time used for boned chicken, not saute time as used for chicken breasts? I will definitely give this a try. Protima, Follow the same steps that I have for chicken breasts. Let me know!! Hi Bushra! Although I have not made it, I am sure it will work in Instant Pot. It should be cooked as slow cooker option or cook on Lo Pressure mode. Amazing recipe! Just got my instant pot today and this is is first thing I made in it. 🙂 So glad, the biryani was flavorful and tasty. Much more convenient than the dum cooking when you want to fix up some biryani in a short time. Thank you so much for this! Hi Archana, love all your recipes and am trying out the chicken biryani today! If I use 4 lb bone in chicken do I increase the first cook time to 7 to 8 minutes? 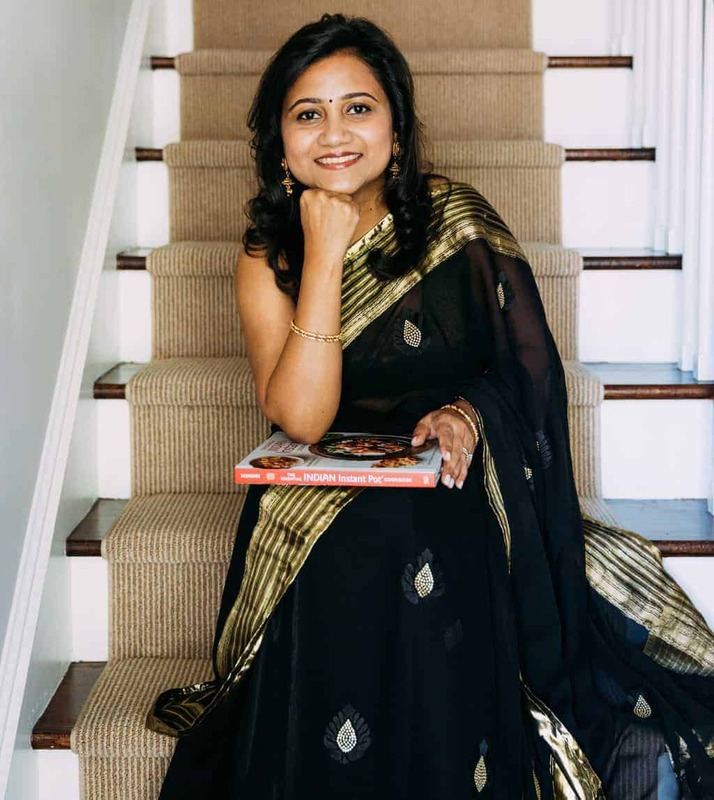 Hi Gayatri! Thank you, I am glad you are enjoying my recipes. Cook time remains same even if you have more chicken. You can follow the recipe exactly 🙂 Let me know how it comes out. Came out fragrant and delicious, thanks!! Oh YAY! Do try some of my other IP recipes. They are all easy and delicious. Hi Christine! Awesome!! 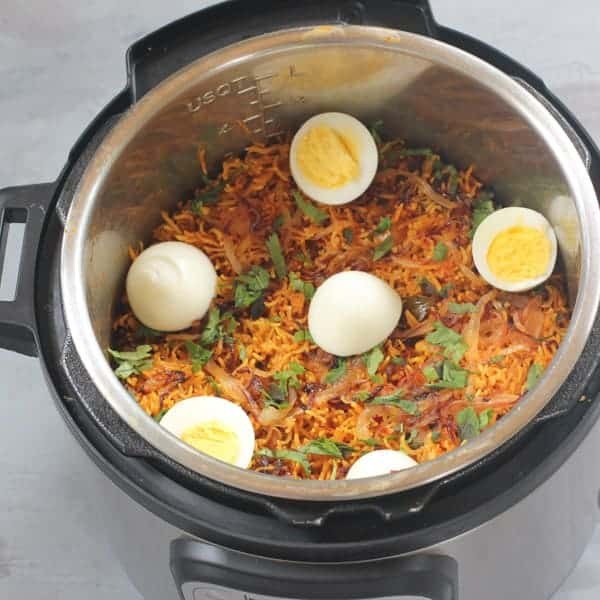 I am so happy that you chose my Biryani recipe as your first Instant Pot recipe. Its all about the initial cooking experience and if it is positive and yummy you want to cook more!! I love how easy and delicious this recipe is in IP. You will enjoy my other recipes too 🙂 Thank you for your feedback, it truly made my day! I’m a skeptical newbie….this is was excellent…thank you!! Thats great! So happy you enjoyed this! There is also a butter chicken recipe that you will enjoy in IP! oh ok.. thanks for the tips Archana! will try it again soon! 🙂 n also can i use brown rice instead of white rice and what would be the cooking time? Brown Rice Needs 22 mins of cook time. Hi, thank you for sharing your recipes! 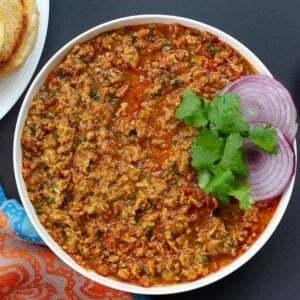 Have you tried this with goat meat? What will the timings be? Although I have not tried with goat meat, few of my readers have and tell me that it comes out delicious. Same timings. Let me know if you make it. Hi – I have sona masoori rice. Have you tried cooking with that type of rice? Same quantity of water as basmati rice? I always use Basmati rice for Biryani. I think Sona masoori will also work well, except that it will not be long grained. You can follow the same time and water ratio. Please let me know how it comes out! Tried this recipe today and it was delicious! Thank you!! Awesome! This is my FAV IP recipe. So glad you tried and liked the flavors. Hi! Thanks for sharing this recipe. It was the 2nd dish I made in the IP. The consistency came out good, as well as the tenderness of the chicken breasts, however I felt like it lacked in flavor and spice. Any suggestions on how to add flavor in the back end? I probably marinated the chicken for 1.5 hours. Would you recommend a longer time? Thank you and look forward to your response. Hi Lisa! So glad you tried this recipe. To make it more flavorful and spicy you can add some more garam masala, red chili powder and jalapeños.You can also add some whole spices like 8-10 black pepper corn and 6-8 cloves in the chicken. I just tried this tonight and my husband and I couldn’t eat it fast enough! It turned out perfect, just like our moms would make. Just divine! Also made me love my Instant Pot even more 😉 This recipe is going to be archived. Thanks so much for saving dinner! Hi Saba! Your comment made my day! Comments like these make all the time and efforts I put to perfect my recipes well worth it. Thank you Thank you!! Hi Archana! Question – on the newer Instant Pot Ultra 60, there’s no manual mode. Would you suggest using any of the other settings and adjusting the time? For example, there’s an “egg” setting with 5 minutes. The pressure is high by default. Can I use this (I usually make more, so the extra minute is probably fine). Hi Saba! On the newer Instant Pots, Manual option is replaced with Pressure Cook. So you can use that to set the pressure cook time. Let me know if you have any questions and how you like this biryani! Hi Archana! I’ve tried this recipe before, but that was on my old Instant Pot. On my new one, I just wasn’t sure about which setting to use. I’m still getting used to it. In any case, in general, would you suggest high pressure setting (on pressure cook) for meat/poultry dishes and then low pressure setting for veggie dishes? I’m in learning mode and trying to get a better feel for it, since I haven’t been using the Instant Pot that long. P.S. I used the pressure cooking setting on high pressure for the chicken biryani, it turned out great again! Hi Saba, Thank you for your feedback. So on the new Instant Pots, Manual button is replaced with “pressure cook”. And like you said high pressure works great for poultry/meal/beans etc. Low pressure for veggie dishes. And looks like are already making Biryani in the new pot! We made this over the weekend (first recipe in my new Instant Pot!) and it was amazing! So easy and delicious and we had it for lunch leftovers today. Served with some raita and it was perfect combination of spicy and cool. Thank you – we’ll be making this again and again! Hi Jasmine!! Thank you!! You made my day. It means so much to get this feedback from a talented blogger like you. I am so glad you decided to make this and enjoyed the flavors. I think it’s better than any restaurant version. Also, you might like my shrimp and veggie biryani recipes too! Enjoy your new Instantpot it is so much fun to cook in it! Turned out great!! Thanks so much! i have lost count of the number of times i have made this dish and it only seems better each time according to my boys! Awesome!! That makes me so happy!! Thank you Vidya!! Comments like this make the time I take to perfect the recipes worth it!! What kind of red chili powder do you use? I haven’t tried the recipe yet because I’m a little concerned about the amount of heat. I know I can just cut back, but wonder how hot the dish is, made as written. Thanks! Hi Jeff!! I use Kashmiri red chili powder which is mild. But the heat in Biryani is from the ginger and garam masala too. You can cut down on garam masala and red chili powder and add more in the end if needed. Made this last night and it was very tasty! Thank you for the recipe. Maybe it’s a matter of personal preference, but we thought 3 cups was way too much rice. Is Biryani supposed to be this rice-y? Thanks again! Hi Mike! Thank you for your feedback. As you said, it is a matter of preference. You can try reducing Rice to 2 cups. But Biryani is a Rice-Y dish. If I wanted to add potatoes at which point would I do that? Hi Wajeeha, add potatoes just before you add the rice. Cut potatoes into cubes so they will cook perfect with Rice. Layer them on top of partially cooked chicken and then layer rice over! It will be delicious ? Thank you for letting me know Wajeeha! Biryani is on repeat in our home ? It will come out great! Just remember to soak the rice. Let me know if you have any questions. Hi Jeanne, try following this recipe exactly and you will not be disappointed. Let me know if you have any questions! You can certainly reduce the chicken and Rice amounts. You may also want to reduce the red chili powder and garam masala too unless you want the Biryani to be spicy. And water to rice ratio is 1:1. So for 2 cups of rice you will put 2 cups of water. Remember to soak the rice for 20 mins. Let me know how it comes out for you. Thanks Archana. Any change to cooking time? Jenny, Same pressure cooking time. Had a quick question. Normally I add 2 cups of water for one cup of rice, but in this recipe you mention 3 cups water and 3 cups rice. Is that generally the case for all basmati rice? Hi Aditi! Only for Biryani it’s 1:1 ratio since there are also liquids from chicken and the yogurt. Hence reducing the water ratio plus for biryani you want the rice be firmer than usual. Hope this helps? Looks great can I half the recipe ? Absolutely! Half all the ingredients, reduce saute time for onions but same pressure cook time. It will be delicious! A little heads up. Today I made again your biryani (excellent as usual) and I purposely waited until it went “hot” before adding the ghee to sauté the onions, BUT within 1 sec, and before I could do anything, my IP went dead. All the lights were off and there was nothing I could do. “Gosh, has it blown?” I thought, but it seemed unlikely. I suspected that it had shut itself down as a precautionary measure, and in fact within a few minutes it started again and at last I could begin cooking. Hi Andrea! So glad you are enjoying the Biryani, it is my FAV too! I wonder what is going on with your Saute option. Might be a good idea to call Instant Pot support, they truly are super helpful. Just incase there is something wrong with yours? I think we have the same one 7-in-1 duo which is my FAV model. Hi Andrea, Thank you for following up with the IP experts. I will just preheat the IP for a couple of minutes going forward instead of waiting for the hot sign. Hi Archana – do you use the measuring cup that comes along with the IP or a regular measuring cup? The sizes are different thus the question. What size of instant pot did you use for this recipe – the 6 quart or the 8 quart? I am a new ip user. Tried this recipe today…so easy yet so delicious. You made my life easier today. Thank you for sharing your recipe. Hi Subha! Thank you for your comments. I am so glad you enjoyed this biryani recipe. Your recipe calls for 3 cups rice. Is the measure using the cup that came with IP or the standard cup? We love love love this recipe and make it all the time! We love lamb biryani too, so often we’ll swap out the chicken for lamb, and it’s so good! Hi Anne! Thank you for your comments. I am SO glad you are enjoying this Biryani recipe and nice to know that the same recipe works well with lamb. Hi Archana, I tried this recipe today and it tasted very good. I made it with mild spices for my 4 year old with chicken breast. I had marinated them for 1 hour, however they turned out to be chewy and hard. I haven’t cooked chicken as much before and in IP it’s first time so I am sure I have missed it something here. Any views what would have gone wrong? Thanks! Hi Shalvini, Thank you for your feedback. Basically you have to marinade chicken breasts for a longer time, atleast 3 hours, for it to come out tender. Give it a try next time! Loved this!! This was my third recipe using my new Instant pot. This biryani was so simple and easy and it was a treat for the tastebuds as well! Thank you for making me feel like a rockstar! Thank you Sue! So glad you enjoyed this recipe. I recently added star ratings option to each recipe. I would appreciate your rating on this recipe. Can I substitute the spices with Shan briyani masala? And how much of it? Hi Anaum, yes you can! You will have to follow on the package for the marinade depending on how much chicken you are using. I tried your recipe today but my rice in the middle was uncooked. what did I do wrong? Sorry to hear this. What kind of rice did you use and was it soaked for 20 mins? Also did you add all the liquids from the marinade? Just got the Instant Pot for Christmas and truthfully, have been a bit intimidated to try using it. Decided to try your chicken biryani as our first dish. My husband even helped as he was excited to see if the Pot was really as great as we’ve heard. I can honestly say that your biryani recipe was delicious and surpassed our expectations!! We loved it as did our two growing boys!! I’m looking forward to trying out more of your recipes- thank you Archana! Hi Priti! Congrats on your new Instant Pot. I am glad you enjoyed the ease and flavors of Biryani in it. Best part about the instant pot is that the whole family can cook together. I have 2 boys too and it has been so much cooking with the using our instant pot. Just made it today and it was amazing! I bought a mini 3 quart instant pot last month and this is only my third recipe using it. I subbed chicken stock for the water and I think that made it even better. I halved the recipe but followed the rest of the directions exactly and it came out perfect. Hi Din, Congrats on your new mini Instant Pot. It was a good idea to halve the recipe. I am happy to hear that the biryani tastes even better with chicken stock, I will have to give it a try soon. Thank you for your feedback and I hope you will try some more of ministry of curry’s recipes. I tried this Biryani yesterday and happy to say it turned out really awesome. Thanks for precise and clear instructions. Only change I made was 4 cup water for 4 cups of rice and instead of qr after rice I waited for 2 minutes. Prepared this Biryani this evening. My whole family loved it! It was my first attempt at cooking biryani that i have been longing for for years. This recipe hit the spot bang on! What deep intense flavours and the good quality saffron added the final touch..delicious. Will be trying your other IP recipes in the near future. If i reduce the recipe by half, would the timing change? How would you make this recipe if you didn’t have an instant-pot? I’m not sure if I will get one, as my kitchen is already littered with appliances that I seldom use and I’m not sure if I want to add to the crowd. Hi Julia, I will post the non instant pot recipe soon. It is uses different techniques. You can def use Shaan masala instead of all the spices in my recipe marination section. Refer to the masala box for how much to use. You are welcome! Let me know how it comes out. I need to replace yogurt in this recipe, what should I do? My son is dairy free. You can use dairy free yogurt or make it without yogurt. There is already lemon in the marinade. You may want to add 1/4 cup of water when cooking the chicken. 3 cup basmati racie means 250 ml cup or the cup that comes with IP? I use regular cup. The key here is to use the same cup measure for rice and water. Tried this today. Biryani turned out awesome! Thank you! Awesome fool proof recipe! Thank you so much for this!! Was worried about it being watery per a few other reviews, but the rice came out perfectly. Made it with boneless chicken thighs and added shah Jeera along with bay leaves since my Garam Masala does not have it. If you are reading reviews to decide, definitely give it a try. I have made dum Biryani before and this tastes almost the same, with less cooking time and easier process. Hi Archana, Sorry if i’m being a total noob asking this. But what do i do with that milk that the saffron warmed in? Hoping to try it tonight so hope someone could give me some guidance! Sorry! I just watched your video and figured it out! THanks.. looking forward to making this!! Hi Grace! Sorry just seeing this now. Hope you enjoyed the Biryani? How do I change this if I’m using a slow cooker instead? Hi Lisa! I am so sorry. I have not tried this recipe in slow cooker to give you the exact timings and water ratio. Hi! I made this for the first time today and it’s delicious! From the comments and your replies I learned to watch the amount of liquid in the pot after cooking the chicken and reduced the water for the rice. Sorry if you had already explained this but why do you cook this in 2 stages? Can the rice and chicken be cooked at the same time? Thanks! In my original recipe I used bigger pieces of bone in chicken which needs extra cooking time. So I cooked it in 2 stages. Also if you pat dry your chicken with paper towel before marinating in regular yogurt, chicken chicken does not release as much water. I am so happy you enjoyed the flavors! Hi Archana, Let me start by saying that I absolutely love your recipe of chicken biryani. I inaugurated my IP with this recipe and it came out great. The next time I became more adventurous and ended up with a few challenges. I doubled the chicken but kept the rice as three cups with three cups of water. The IP did not build full steam and in fact showed the “burn” notice on the front. What should I have done differently to avoid the burn notice? Thanks in advance. I am new to instant pot and I recently bought Ultra 60 10 in 1 IP. The first recipe I tried is your chicken biryani. after the Rice was put on manual Hi for 6 mins and after the QR, I noticed the Rice was not fully cooked. So put in little water may be 1/2 cup and put it manual Hi for 4 min but then after 2 mins I got the signal “Burnt” So I just cancelled the whole thing and switched it off. When I opened it the rice was done but lt was very very slightly burnt. The Biryani taste was awesome!! But still I wanted to know if the setting needs to be changed for my Model? If the rice looks little uncooked, simple fluff the top with a fork and close the Instant Pot. It usually cooks with the heat inside the Instant Pot. If not just sprinkle water on top and keep Instant Pot closed. Turning the Instant Pot on after all the liquids are absorbed usually will cause burn. 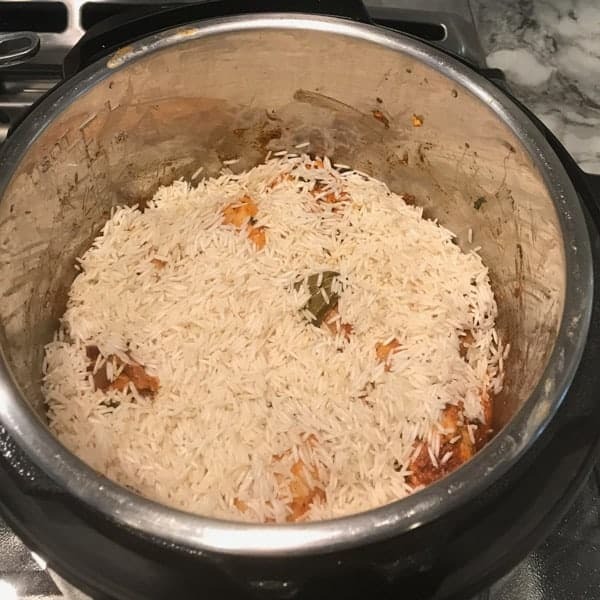 I have never made Chicken biryani ever and of course 1st time in instant pot. It came out delicious. I needed small portion so used 1.5 cups rice. For that 6 mins were long as had a bit of a burnt layer on rice at the bottom. Next time will put for 4 mins. Otherwise came out very well. Thanks for putting this recipe up. Awesome for a first timer!! Deglaze the pot well after adding water, this will prevent the burn. Hi! Instant pot beginner over here! Thanks so much for this recipe! So like a few commenters above, my rice came out mushy from too much water. I think my chicken was wet when I was marinating it. Anyway, is there any way to fix this? I tried pressure cooking it again with QR for another 15 minutes but its still really wet and mushy. Any suggestions? I would just put it out in a platter and reheat in the oven. Cooking it longer will only make it more mushy. Hope this helps. thanks I’ll try that. What heat setting should I use to try this method? Rose, allow the biryani to cool down first, that itself will take a lot of moisture away. Then you can heat uncovered at 400 degrees. Amazing Biryani recipe Archana! Thank you so much for posting it. I have prepared this couple of times and my family loves it. 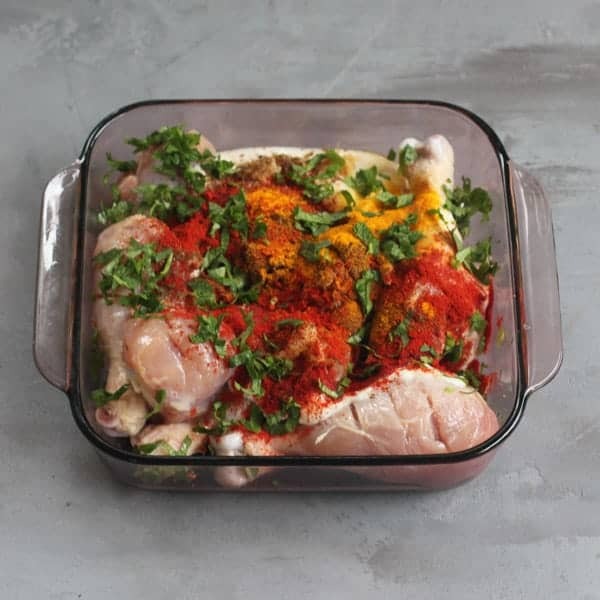 Have a quick question – I use mix of bonless chicken breast/thigh pieces and chicken drumsticks. Because of chicken on bone, used 4 mins QPR option. Drumsticks turn out nice and soft but the bonelss pieces become quite dry. Should I reduce the timing? Can you please suggest what I can do differently? Hi Swati, Thank you for your feedback. So happy that you are enjoying this recipe. For boneless pieces the instructions call for just sauteeing. Depending on the size of the chicken pieces, I would just saute for a few minutes. You do not have to pressure cook them. Great, I will try just sauteeing. Thanks for the quick response Archana! 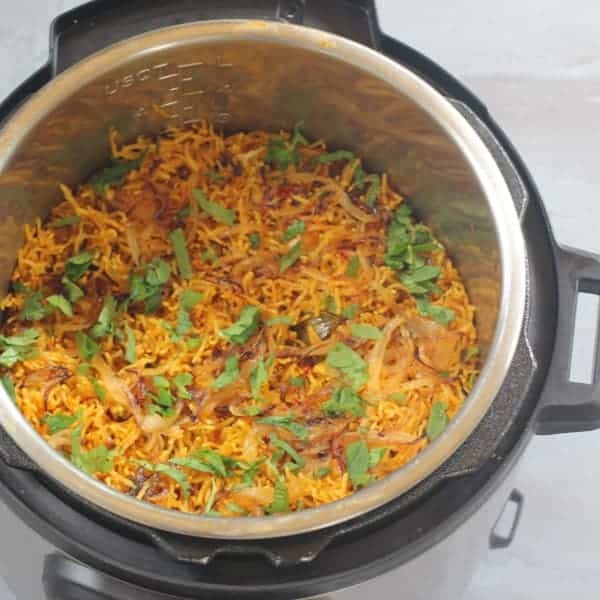 This is my FAVOURITE Instant Pot recipe and also my favourite biryani recipe. A million times easier/faster than making it on the stove and the result is always perfect. Thank you for this! Thank you for your lovely feedback. Enjoy! 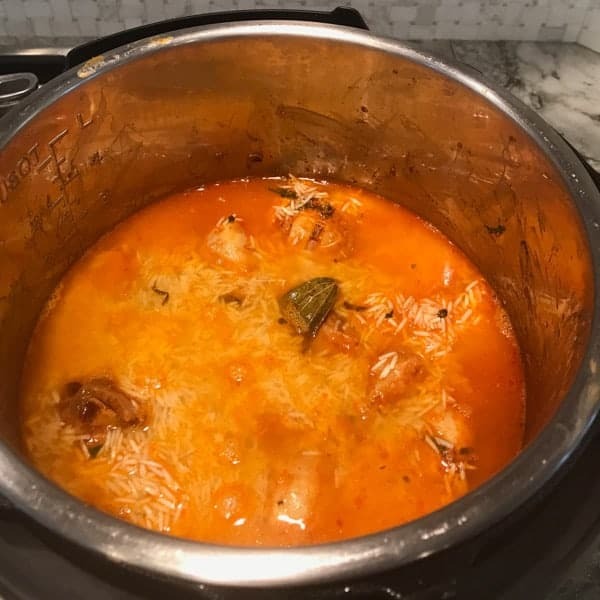 I tried this recipe by doubling the quantity….My Biryani was undercooked first time… I added some water and cooked for another 6 minutes manual – it was over cooked and burnt at bottom… I am not sure what went wrong with this? Hi Aanchal, Did you soak the rice for 20 mins? And was it long grain basmati? Also after the first cycle completes, there is barely any water left in the Biryani for more pressure cooking. Even if you add water its not going to help the pressure cooker come to pressure unless the whole biryani is mixed up so the water reaches the bottom of the pot. Also for 6-QT doubling this recipe might be too much overfilling? You can also just fluff the rice and keep the Instant Pot closed to help cook the rice further. This recipe rocks! The mint, cilantro and bay leaf had my taste buds dancing for joy. I am a novice cook and you made this easy for me, THANK YOU. It’s awesome. Thank you so much for sharing your recipe. Hi! I will be trying this out this weekend. Can I substitute coconut milk (from can) for yogurt? Thanks! Hi, yogurt is for marinating the chicken. Coconut milk will not make a good substitute. You can instead add a bit more lemon juice. Would you share your raita recipe, please? Hi! Sure – 1 medium red onion finely diced, 2 fresh plum tomatoes finely diced, 1/2 cup cilantro. 2 cups plain yogurt, 1 teaspoon salt. mix well and enjoy! Hi Archana, recipe looks great, I don’t have an instant pot, can I cook this in a large stock pot instead? Not sure of cooking times? Hey, yes you can. Cook chicken until its 3/4th done. In a separate pot cook rice till it is 3/4th done. Then Layer rice over chicken and cook covered for 20 – 30 mins on low heat. Amazed by ur blog.Thanks for sharing the recipes. But IMO the instant pot biryani turned out more like a spicy pulao,still good but I wud like to go back to plain old stove n pot for biryani. I tried this recipe for the first time with friends over for dinner. There were only 4 of us but we polished it all off! Everyone enjoyed it but we all had the same concern there wasn’t enough of the flavor. I’m new to cooking indian food, my southern mother doesnt cook with any spice but salt and pepper, – is there substantial variation in spice quality from different stores? And, we hardly had any heat, I did add the whole jalapeno. The rice and chicken cooked wonderfully and was the perfect texture, I just wanted a bit more flavor (and i added the extra amount of garam masala)! Thanks for the recipe, it is a keeper in my house! Hi Lori! Thank you for your detailed feedback. 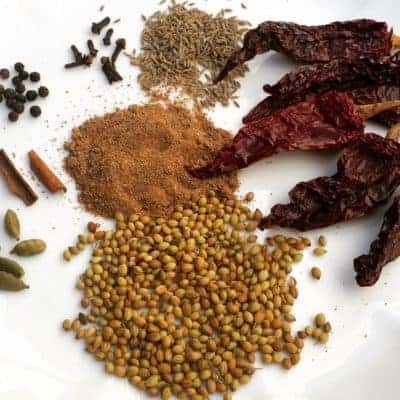 Good quality Garam Masala can make a big difference in Biryani flavors. Have you tried making it at home? I have an easy recipe that uses only 5 spices on my blog. That would really add flavors -and heat. You can also add more red chili powder and make sure the one you have is fresh. Hi Neha, yes no need to pressure cooked chicken tenderloins. You can cook everything together. 4 mins NPR will work. Doing it first time and it really turned out Awesome. Thank you for the detailed information. You are welcome! Thank you for your feedback. Hi – I am so excited to make this today – just a question- red onion or yellow onion? Hi Vikki, I use yellow onions. How can I double this recipe? For 6 cups of rice and 4 lb chicken.. how will the cooking time vary? You do not have to double the pressure cook tome. Although, I feel that might be too much for a 6-QT. Do you have an 8- QT? 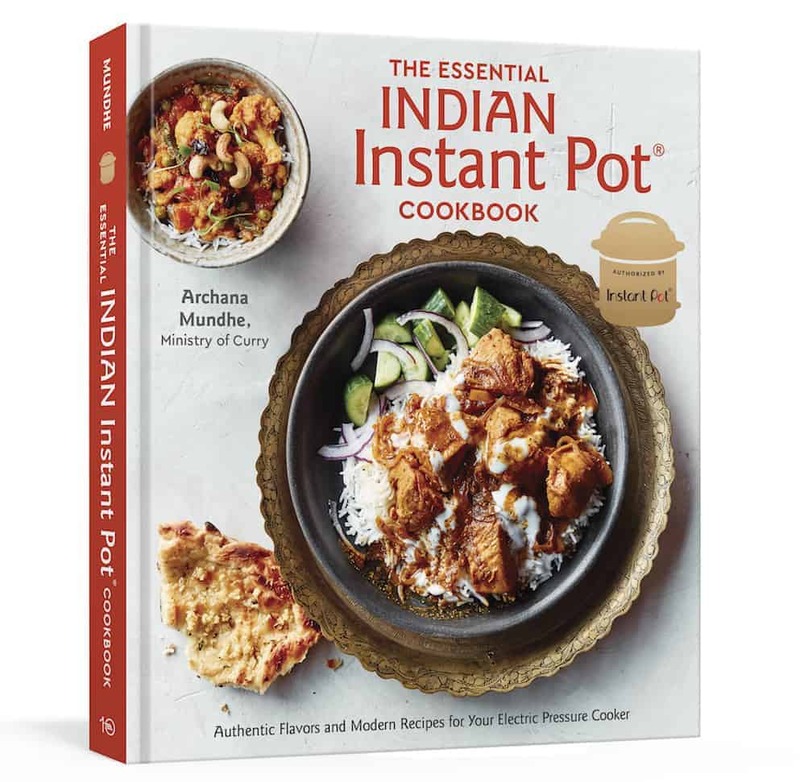 Hi Archana, I have an 8 QT instant pot. Can I double the recipe in there without the risk of it being too full? If yes – any modifications you suggest? Yes! I would suggest you saute the onions in a seperate pot on stove top. That will save a lot of time and also avoid any burn related errors. so this is really good. todally man you really know your cute little stuff!!!!!!!!!!!!!!!!!!!!!!!!! Is there a way of making this without using an insta pot?? Hi Andrew! Yes, you can cook the chicken 3/4th way through in a large pot. In another pot cook the rice about 3/4th way through. Then layer the rice over the chicken and cook covered on low heat for 30-40 minutes. Hi! Is there anyway to fix the rice if it came out too mushy in the instant Pot. One question : do you put 2lb chicken if you use chicken breast ? I have an another question : when you make biryani, do you put tomatoes ? Because my mom and dad when they make this recipe they always put tomatoes. I don’t know when exactly, maybe when they fried onions. If i’m asking to you it’s because my parents are in India now for holidays so i can’t ask them… my mom only learn me how to make pulao before leaving me, snif. Biryani khane ka bhaut man howa mujhe, snif ! Also do you know a recipe called “mattha” ? It’s so good with biryani ! This is my parents version : in a mixer you put 125gr (1 pot) yoghurt, 2 garlic cloves, 1 or 2 little green mirchi and handfull, or maybe more, coriander. Then you mix everything. Then in a bowl you put 250 gr yoghurt, you mix the yoghurt a little with a whip in order to make it liquid. Then you put what the mixer contain in the bowl and you whip everthing. You finish by putting a cup or maybe 2 cups water and salt to taste then you whip everything. Try this inshaAllah. Also do you know how to make a recipe called “khichda” ? This is my favorite recipe when my mom cook, and my favorite recipe from my dad side it’s biryani. ps : sorry if my english is not correct (my hindi/urdu too), it’s because i was born in France. I do not put tomatoes in Biryani but you can put them along with the chicken. We make Mattha a lot in summers to enjoy with Khichdi, same recipe you mentioned except we put ginger instead of garlic. And yes love Khichda, although not exactly the same I have a few Khichdi recipes you may want to try. They are our goto for weeknight meals. I tried the recipe today with overnight marinated chicken, tasted awesome. Color, spice, measurements , cooking time everything worked perfectly. Thank you Razia for this great information. Hi! What if I am using boneless chicken thighs? Would that work? Hi Maya, Yes it will work. Check the recipe for details on how to cook with boneless thighs. Sorry just thought of this, but what if I wanted to add potatoes. Same cook time? Hi Maya, you can def add cubed potatoes. Layer them on top of the chicken just before you add rice. It will cook perfectly with rice. Third time made this recipe. It came out best. Our family love this meal. Thanks. Thank you for your lovely feedback. So happy to hear that the whole family enjoyed the chicken biryani. I want to add some pieces of chicken. And I normally cook biryani without chicken for 5minutes. 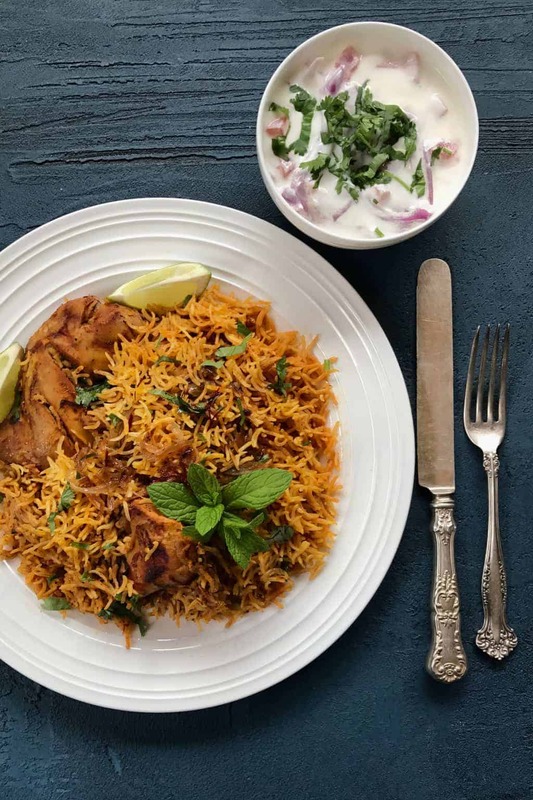 Does biryani need more time to cook with chicken? Do I need to cook chicken and rice together? For boneless chicken you can just saute it for 2 to 3 minutes then add rice and it will cook along with the rice. I made this tonight but the chicken was quite hard and dry, any idea what i did wrong? What kind of chicken did you use and how long did you marinate it for? I used chicken breast and marinated it for about an hour or two. Just like to add that I’m actually Vegan, I’ve only cooked chicken a few times for hubby – always in a saucepan and it’s fine, this was the first time in the instant pot. Hi Radhika, For chicken breasts, just saute marinated chicken for 2 to 3 minutes, no need to pressure cook first. Then add soaked rice, cook for 6 minutes and allow 5 minutes of natural pressure release before you open the pot. I made your recipe tonight and it came out delicious! We all enjoyed it, including my 11 month old grandson, of course with some extra yogurt. yay! Makes me so happy when little children enjoy my recipes. Made this tonight, but took some shortcuts. Patak’s makes a very good biryani paste, so I used about 6 Tbsp whisked with the yogurt in place of most of the mixed spices for the marinade. I also made Madhur Jaffrey’s hot and sour chickpeas, using the IP to soften them up from dried in 40 minutes instead of soaking for 20 hrs. Both dishes were wonderful! That sounds delicious! So glad Patak’s biryani paste worked well in the marinade. And those chickpeas must have been yummy!! Amazing recipe!! Comes out perfect every time. One question on the amount of rice, if i increase the rice measurement to 5 cups-5 cups of water, do i need to increase the pressure cook time? or will it still get cooked in the same time? Thanks in advance for your time. Thank you Farzana for your lovely feedback. Yes rice to water ratio is always 1:1 as long as you soak the rice. Although make sure your pot isn’t too full. Chicken plus 5 cups of rice might be too much unless you have an 8 quart. Hi Archana. First of all Thank You for the recipes. They have been awesome and by following these one can become an instant star chef :). I have been using your recipes vey regularly. However I haven’t had great success with the Biryanis yet. Quick question for you. When you mention cup measure I am assuming you refer dry cup measure for dry ingredients and liquid cup measure for liquid ingredients. Can you confirm please? I think I am messing up there. Hi! Thank you for your lovely feedback. I use the same cup to measure rice and water. I hope that will clear up any confusion. 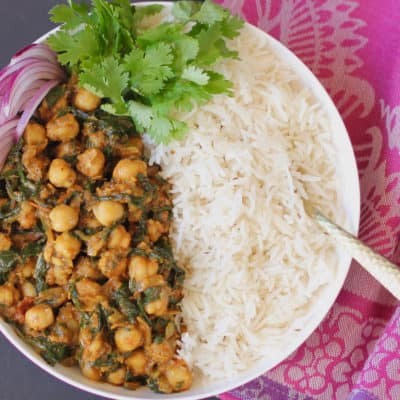 Hi Archana, this recipe looks amazing and I’m planning to try it this week. We have always made biryani with potatoes but I can’t find any Instapot biryani recipe that incorporates potatoes. Do you think there is a variation of this instapot recipe where potatoes can be incorporated? Hi Sana, You can def add potatoes to this recipe. You want to add potatoes before you add the rice. Layer potatoes, cut into one inch cubes, then add rice and water. Gently push all the rice under water. If there is lot of rice that is not under water, add extra 1/2 cup of water. Let me know how it comes out. Would this recipe work if you substituted chicken with chickpeas? 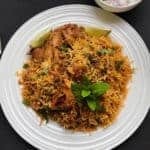 I know you have a chickpea biryani recipe (which we tried and enjoyed), but for some reason the flavor of the chicken Biryani was better, and I’m wondering if that’s because of the yogurt marinade? Sure you can totally do similar marinade for chickpeas. Hello , this might be a silly question as I am an amateur cook. How to pressure cook chicken for 4 minutes initially without water? wouldn’t that burn the pot or something , because I though pressure cooking requires you to add some water always. Hi Sam, Very good question actually. So the marinated chicken releases enough water for the chicken to pressure cook that you do need to add more. Unless you are cooking chicken legs or drumsticks with bones you can also skip the initial pressure cooking step and just saute the boneless chicken. After pressure cooking or sautéing the chicken initially you have to make sure to deglaze the pot by nudging the browned or stuck bits from the bottom of the pot. This step makes sure that the pot will come to pressure properly. Just made it with the potatoes! They were so tender and the dish itself was awesome. Thanks so much! Happy to hear Sana! Thank you for the feedback. Please rate the recipe. Thank you! Hi Archana, this recipe looks amazing. Since I don’t own an instant pot, I’m planning to make this in my oven. Do you suggest I half cook the chicken first? Yes! Cook the chicken atleast half way through and then layer with rice. I wanted to try this tonight but I want to do the same amount of chicken but half the amount of rice, what else would I need to change? I’m assuming I use the same amount of ingredients to do the marinade but cut the water quantity in half? Hi Christy, I agree, Indian Biryani usually has more rice in it than chicken. I have made this recipe with 2 (regular) cups of rice and water. It comes out delicious. You can reduce the red chili powder by half and keep all the other spices same. Let me know if you have any other questions. This looks amazing!! How would you alter this recipe if you were going to use brown rice instead of white? Love your recipes and have pre-ordered your book. 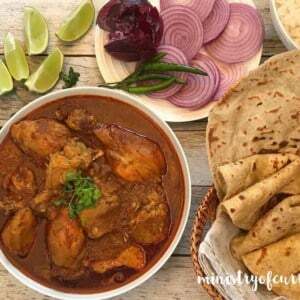 Do you have an easy chicken Yukhni Instant Pot recipe that you could share? Thanks! Thank you Moushumi! I do have a yummy yakhni recipe, will post soon. I tried this recipe today. Overall pretty simple and straight forward and turned out very good. I carmelized the onions on a pan outside. When I put the marinated chicken drumsticks and onions to cook before rice got burn sign. What do we do at that time ? Release the pressure and start it again ? Hi Roma, Good idea to caramelize the onions separately. I am surprised you got the burn sign while cooking the chicken. Did you add all the marinade liquids too? I usually add everything. Also make sure your sealing ring is secured properly. The only reason for a burn is not having extra liquids or something food sticking to the bottom of the pan. In case of a burn, sign usually there will be no pressure build, so you can open deglaze the pot to see if there is anything sticking to the bottom, add some water if the food looks dry and start cooking again. Hope this helps. Thank you for trying these recipes and giving your feedback. Hi Archana! I’m in the middle of making this biryani for the first time. I am really hoping you can answer my question quickly. Why do the instructions say to add only the half the marinated chicken? What do we do with the rest of the marinated chicken? Thanks Archana for such a quick reply! It turned out great. This is delicious! I took a minute off the cook time since I had a bit less chicken and rice on hand and it turned out perfect. Maybe a little less salt next time, but that’s just personal reference. Thanks for a great recipe and such detailed instructions. Thank you for the lovely feedback. I am so glad you enjoyed the biryani and the raita. Thank you Yash! Did you get a chnace to look at my new cookbook that is now released? Hi there! I absolutely love this recipe, and would love to share it with my parents who don’t have an instant pot. Is there any way to convert it to slow cooker/stovetop/oven, or should I convince them to get their own IP? Hi, I like how fluffy your rice looks. What brand of basmati rice do you use? Kohinoor Extra long grain rice. Can you use forzen chicken? I have Chicken tenders that are frozen. would it change the recipe? Or do I need to wait for the Chicken to thaw befor using? Chicken will thaw as you marinate. My biryani keeps showing burn, how do i fix it? I followed the recipe but it became soggy. What can I do to fix it? Hi Natasha, Sorry to hear. Just make sure to pat dry the chicken before marinating and drin the rice well next time. 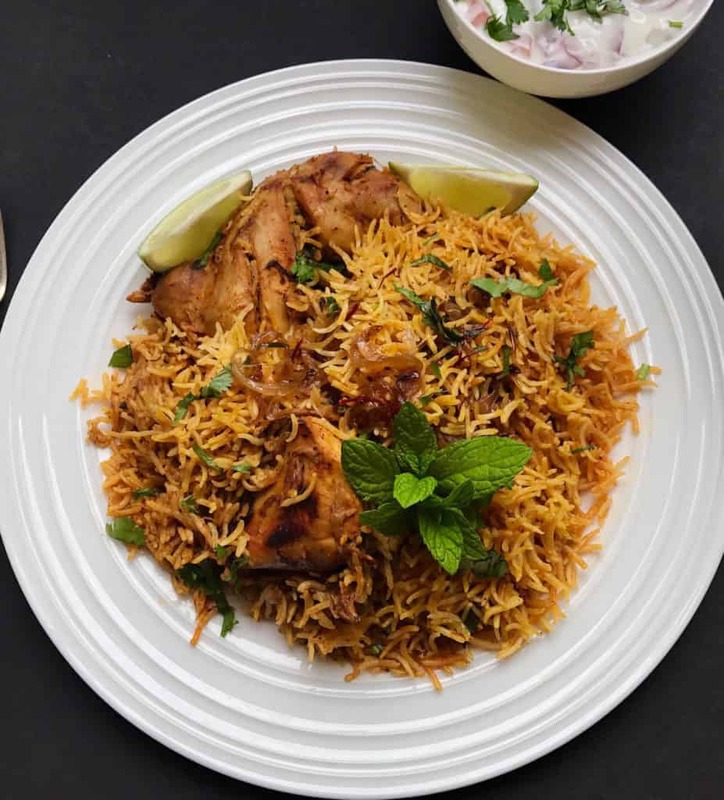 The chicken biryani captures the marvelous flavor, and it is one very simple and instant chicken Biryani recipe that can be made at home with not very lengthy list of ingredients. 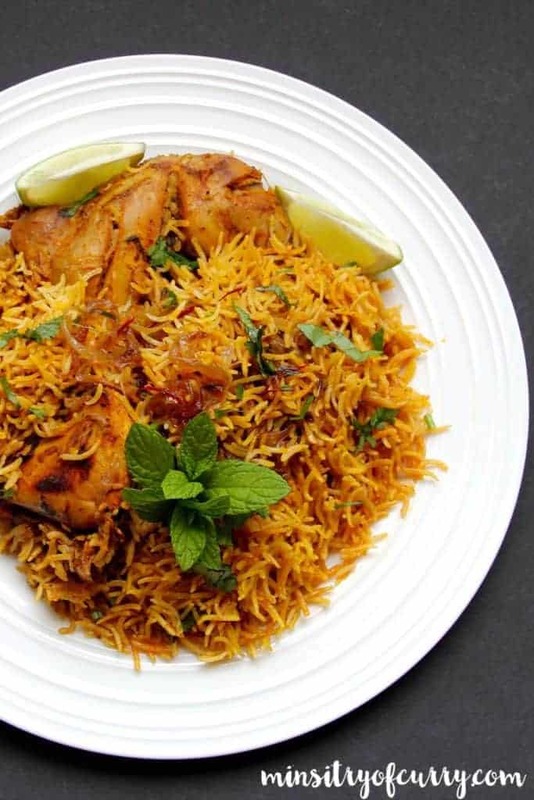 There is an exotic chicken biryani that needs a lot of time and not very easy to make. I am so glad you enjoyed this simple & flavorful version of chicken biryani. Bland white girl here. I have been sick of the usual food I cook and know how much I love Indian cuisine. Found your recipe and decided to try it in my brand new instant pot. 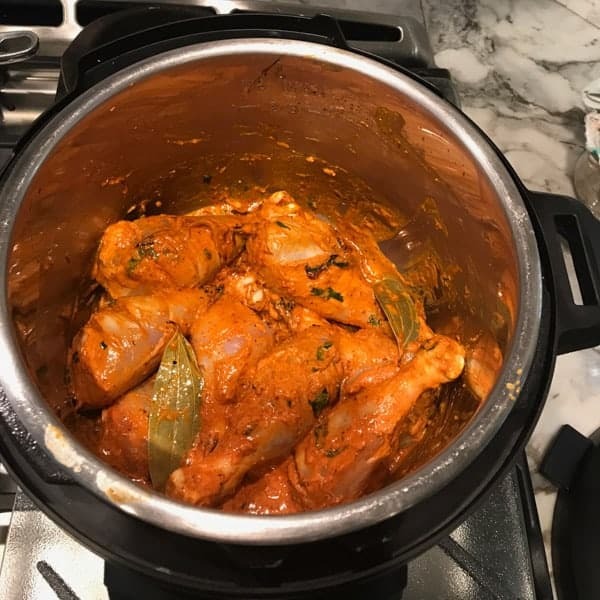 I also found a butter chicken recipe and so today cooked both in my new pot. Amazing results! I have cooked for an army and right now there’s only myself and my daughter home. . When I posted the pictures of my food to my family there was an immediate outcry to make sure I save some. It is some of the tastiest food I’ve made in a long time. Can’t thank you enough. The only small change I made was I added homemade chicken stock to the rice instead of water. Worked really well!! Thank you thank you!! My palette breathed a sigh of relief this day!! Excellent recipe. I marinated the chicken overnight and did add a table spoon spoon of corrionder powder. Turned out perfect and one of best biryanis I had in recent times. Thank you for Sharing the recipe. Can we double the recipe in a 6 qt pot? It will be too much for 6-QT. I would do 2 batches instead. Hi! What’s the max cups of rice I can do in 8 qt? I was thinking four cups? Depends on the recipe. For this one you can double. Hi what is the max amount I can do in the 8 qt? Hi, i just tried the recipe as per instructions and its turned out pretty good. But my chicken boti always breaks in the instant pot, even when i make pilao. Any tips how i can avoid that? Hi Humaira, Thank you for the feedback. May be you are making the pieces too small? Try using larger chunks of chicken. If using boneless you do not have to pressure cook teh chicken by itself. Just cook it along with rice. A small question. If I want to use a mix of boneless chicken and drumstick, how do I go about cooking it? Should I cook both separately? Hi Else, You can saute for 5 mins after adding the chicken. No need to pressure cook just teh chicken. Deglaze really well, add rice and pressure cook. In step no 5a while cooking the chicken, do we put it on pressure cook high or normal? I had it on high but it gave burn signal. Also when we set it on 4 mins the display should be like 00:40 or 00.04? And 4 mins Start instantly after on signal or when it starts showing number 4? Sorry these are very basic questions but I am new to IP hence ignorance. Hi, I have one question. Can I use bone in Chicken breast? I’m not a fan of dark meat. Love your recipes, thank you. Yes for pressure cooking 4 mins for large pieces of bone in chicken. Add all the marinade and then the chicken releases lots of liquids when cooking.